Arianespace’s medium-lift Soyuz launcher is set to loft Gaia – a European Space Agency (ESA) spacecraft – on a December 19 mission that kicks off the star-mapper’s ambitious journey to chart the Milky Way. 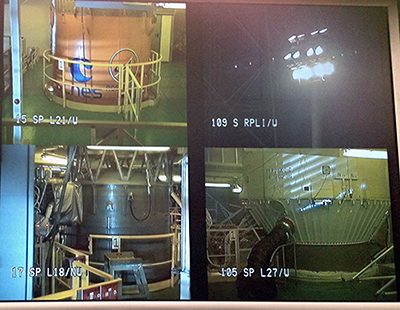 The Jupiter Mission Control center’s split-screen display provides camera views of the Soyuz launch site in French Guiana, including close-ups of the vehicle’s stages and payload fairing. Final preparations are now underway for liftoff of this Russian-built workhorse from Spaceport at precisely 6:12:19 a.m. local time in French Guiana. Soyuz will carry out a nearly 42 minute mission to deploy Gaia en route to the spacecraft’s final operating position some 1.5 million kilometers from Earth at the second Lagrangian point, L2. After liftoff, the powered phase of Soyuz’ three lower stages is to last approximately nine minutes before the upper composite – consisting of Gaia, its adapter and the Fregat upper stage – separates. The autonomous and flexible Fregat stage will then conduct two burns, each followed by a ballistic phase prior to Gaia’s separation, which concludes Arianespace’s 41-minute, 59-second mission. Designated VS06 in Arianespace’s numbering system, this mission is Soyuz’ sixth launch from French Guiana, where it has joined the company’s heavy-lift Ariane 5 and lightweight Vega in operations from the Spaceport. ESA’s impressive Gaia mission seeks to understand the origin, structure and evolution of the Milky Way galaxy by creating a map of more than one billion stars. The Astrium-built spacecraft will precisely chart stars’ positions, distances, movements and changes in brightness by observing each of its targets approximately 70 times during its 5.5-year design life. Gaia is also expected to discover a large number of celestial objects such as asteroids, newly formed stars, stellar explosions and black holes.